I have one living grandparent, my dad’s mother. She is a treasure of a person. Oh yeah. Just because I didn’t remember my grandpa Shep, who died when I was two, didn’t mean she’d forgotten him. She was so independent, so fulfilling as a grandma, I forgot she’d once been part of a team. It had never occurred to me how much she must miss him. 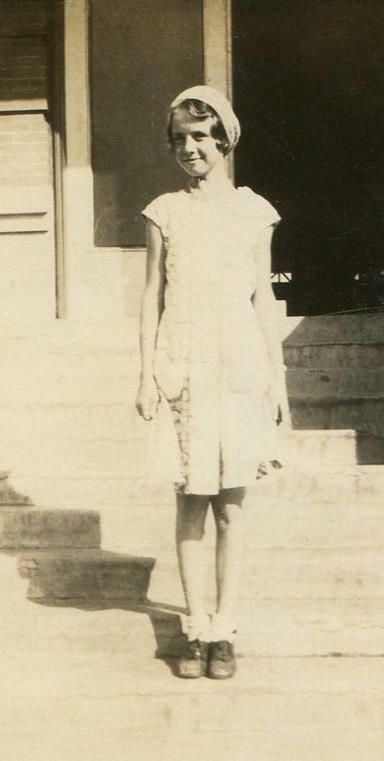 Edwina (pronounced Ed-WINna) was born in Claude, Texas in 1918. In her family, she had a big sister, a younger brother, an even younger brother who died of the flu as a toddler, and a very much younger sister. From what I can understand, she was a smart cookie and a cutie. There’s a “Wina’s childhood” story involving a roof the kids used to slide down, and a protruding nail, and a lot of screaming. ‘Tis an immortal tale within our clan, one that sticks out most in my mind, but it’s not very celebratory. I’m sure they got up to lots of hijinks that were way more fun. Hi-jinks, indeed. 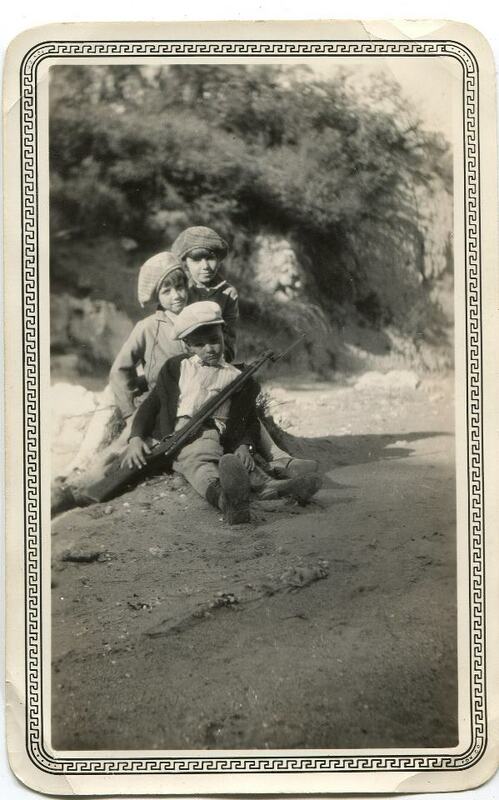 That’s li’l Edwina in the middle. But most of the stories Wina tells are about her kids – a son and two daughters – and grandkids. Many quotable moments are legendary in our clan. My grandma is a tough, brave lady. She met Bob just after World War II broke out. (He called her “Dwina”.) They got married the day he finished jump school. It was hot as blazes and they only had a six-hour honeymoon in a hotel room with a ceiling fan, then went out for an old South-style breakfast with biscuits. Then Wina’s new husband had to leave for training with the 101st Airborne. She gave birth to little Bobii, my dad, in an army base hospital in Fort Bragg in 1943. Bob didn’t quite make it there for the birth, but eventually got to count his son’s toes, and was almost right on the money with his birthweight bet. He was on leave for perhaps three weeks, and then he was off to war and Wina had to figure the rest out on her own. 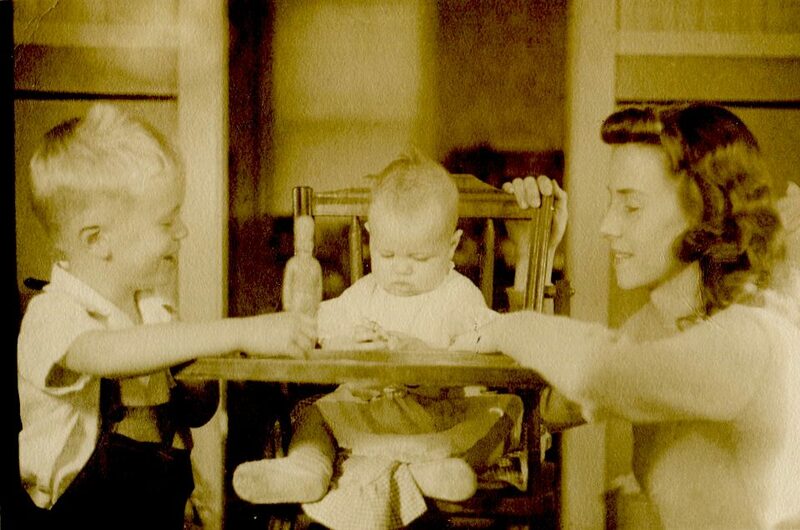 She and her sister shared a home and the parenting of their children – the firstborns only a few weeks apart in age – while their husbands were far away. It was what lots of mamas did back then, managed on their own while (I would think) trying not to imagine their husbands parachuting into Normandy and suchlike. She talks about those times matter-of-factly, as if her bravery is nothing special. The courage of the young wartime mamas might have been widespread, but there’s nothing ordinary about it. I think about the stress of a becoming a mother for the first time combined with the stress of wondering if your husband will be home alive and how many months or years it might be till then… and I simply don’t know how anyone made it through those times. My parents moved to Canada before we were born, so we were the only cousins who never lived in Houston with Wina. Visiting Wina was always a major undertaking, and a wildly exciting venture. In our minds, Wina’s house was inextricable from her beloved self. Wina and Shep had moved there with their kids in the 50s, and everything about it was imbued with the specialness of her. At Wina’s house, the pillows were puffy and bouncy, and her sheets were pretty colours like lavender. (My favourite set had a design of the moon over a beach.) Her bathroom tile was pink and the walls in “our” room were turquoise. There was a poster of Mucha’s Seasons above the bed, which we adored (I now have the same image decorating my laptop). In the kitchen, there was a collection of tiny decorative spoons in their own special rack on the wall, and in her bedroom was a ceramic Jemima Puddleduck music box. I still remember the tune and how it made me sad but happy at the same time, made me want to stay at Wina’s forever. Some things were special just because they were different from home: venetian blinds, and single-portioned yogurts and puddings, and cartoons on TV – Woody Woodpecker is linked in my mind with granola in Wina’s living room. Then there was The Garage, that fabled land which, to my knowledge, never contained a car. It was full of everything else in the world: jigsaw puzzles and photos and thousands of tiny drawers filled with interesting things, especially art supplies. Oil pastels and coloured pencils and confusing non-pencils (that I now understand to be blending stumps) – all part of Shep’s legacy. Just being in that garage felt like an adventure. Picturing all these things, I can almost smell Wina’s house. Eucalyptus, hand cream, and peach potpourri, melded with Houston’s moist tropical heat. Once, after a particularly wonderful visit when I was twelve (so good I cried the entire trip home), I refused to launder the pajamas I’d worn at Wina’s until that scent had completely dissipated. She’s a very humble lady. Though I haven’t heard it recently, she had a beautiful, warbling singing voice I thought all grandmas came with. 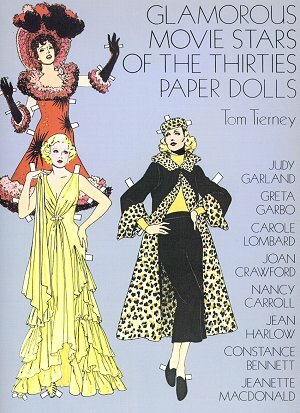 I also didn’t know until adulthood that she was a proficient seamstress who made all kinds of clothes for her family. When we’d look at old photos and say how beautiful she was, she would say dismissively, “Oh, I was never beautiful.” But she was, and is. She is also gentle, generous, giving, forgiving. She’s the kind of grandma who gives up her own bed and sleeps on the couch when her family comes to stay. I can’t recall her ever raising her voice at us, even though we must have been aggravating plenty of times. These were an inspired choice. When I visited alone the summer I was seventeen, she loyally said she enjoyed listening to me learn to play the alto sax from Lesson 1 (so I could be in the jazz band in September) – even though I know for sure I sounded pretty terrible at first. She also understood and forgave much more serious transgressions by people she loved; I remember talking about some of those things that summer, and realizing that Wina’s love, while not at all naive, was endlessly compassionate. The last time I visited Wina’s house, shortly before getting pregnant with E, we spent a lot of time looking at old photos – ones from Wina’s childhood and earlier, those that never really interested me when I was little, but are suddenly fascinating. There was one that I couldn’t stop staring at, a portrait of Wina at about age 10. It held my gaze because she just looked so gentle and sweet, a little shy-and-spunky at once, just the way she is now. It’s written in her high school yearbook too – such a nice, sweet, kind person – over and over. She isn’t just kind and lovely because she’s my grandma – she’s kind and lovely because that’s who she is. Her lovingness arches over our whole family and makes us the unit we are. It’s hard getting old. Wina has always been spry, used to take walks every day with some ladies from her neighbourhood. But bodies will stubbornly age, no matter how well we take care of them. Hers has given her trouble over the last few years. Between aging pains and medications to ease them, it’s hard to feel normal. It’s been very difficult and rough on her, as well as on her children. In 2012, when my aunt and uncle retired and moved from Houston to North Carolina, it was time for her to move too. I think that’s really, really hard. When you’ve been in the same house for more than fifty years – the house where you lived with your husband – you might know it’s not the place to be anymore, but that doesn’t make it easier to leave. Like I said, my grandma is tough and brave. She now lives in a retirement home in NC. When I last talked to her, she never complained about the loss of her independence or living in a place that’s not home. She admitted that it’s “disconcerting” when people she chatted with yesterday in the dining room are suddenly gone, because they’ve died. I miss your home too, Wina. I always will. But far more than that, I miss you. I wish I could share these two great-grandchildren with you in person, that they could know you properly. I wish I could hug your sweet self and tell you I love you, right in your ear, every day. We have some weddings coming up in our family, so for now, I’ll just look forward to celebrating with you. I can’t wait to see you, Wina. I love you more than words can say. This is lovely! It brings back memories of all those visits to me, too. Your sweet, smart, funny, lovely, loving Gramma has been an important person in my life, too, and i love her dearly and admire her, too; this is a splendid tribute! i’ve known Wina for getting on to 50 years now and have never seen these irresistible pictures of her as a child – what fun! 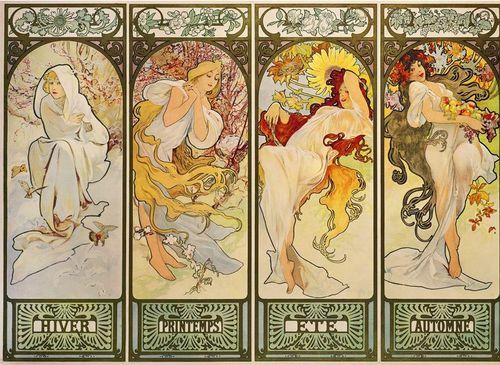 I came across this so beautiful post as I did a search on Mucha’a Four Seasons, that I too have & so love. There are no coincidences. I found your so lovely, well-written tribute to your grandmother. My heart warmed… & a few tears. Your LOVE is True. Your grandmother Dwina lived so long & so well because she had a pure heart. Her beauty shone through as a divine light. Ronnie, thank you for your kind, thoughtful comment! I am so glad you stumbled upon this and enjoyed it. Your reading, incidental though it was, means a lot to me.